Announcing the Mitt Romney Look-Alike Contest. Plus: He’s forgotten before! 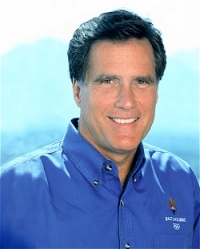 All campaign long, Romney has seemed like a serial identity thief. But perhaps he’s really a serial identity jumbler. Legal and illegal, one-time and lifetime, pro-choice and pro-life—these normally bright-line distinctions aren’t easy for the identity challenged. We don’t criticize the color blind for not being able to tell the difference between green and orange. Should we be so quick to call a man a flip-flopper when he can’t even tell one opponent from another? Memorial Day can be an ordeal for the politician who can’t remember—in this case, who he is, what he stands for, where he comes from, and to whom he is speaking. As a special tribute to his special challenge, Slate is proud to announce the Mitt Romney Look-Alike Contest. Other candidates look in the mirror and see the next president. When Mitt Romney looks in the mirror, he sees yet another face whose name he can’t quite place. Romney gestured to Ralph Reed and said, “Why it’s good to see Gary Bauer here.” Romney then caught himself. “Oh, I’m a little mixed up here,” he said. But Romney still couldn’t place Reed’s face—and had to move on. It’s bad enough that in his rush to convert to conservatism, Romney forgot he was pro-choice, had hired illegal immigrants, and never hunted. Now the man can’t even keep track of his religious-right has-beens. To be sure, politicians shouldn’t be expected to remember every person they meet. For example, here’s a photograph of another Georgia Republican, Rep. Phil Gingrey, who appears to have put on a fake mustache simply to confuse Romney. But mistaking Ralph Reed for Gary Bauer at your own fund-raiser is like going to a Star Wars convention and mixing up Luke Skywalker and Yoda. Bauer is short, bug-eyed, and tight-lipped. No one noticed his 2000 primary bid until he fell off the stage at a pancake-flipping event in New Hampshire. Reed is lanky, with narrow, shifty eyes and a big, plastic grin. In fact, Reed’s eye/grin ratio bears a much stronger resemblance to Romney’s own features. At first glance, you’d think Romney and Reed would know each other well from their time together as cyborgs taking orders from the distant, politically ambitious planet that sent them. Anybody can confuse two people who look alike. Confusing two people who look different but think alike is a far more revealing error. First, it tells us Romney hasn’t spent much time around either Ralph Reed or Gary Bauer. That’s the good news. The bad news is that it increases the chance that Romney might be a cyborg, after all. Politics is a people business, so most politicians file people in their minds by face, name, and place. None of those apply in this case (what would Bauer, who lives in Virginia, be doing at a Romney fund-raiser in Georgia?). That means Romney must use a different, bloodless classification system. When he studies his conservative flashcards, Romney files people by type. Bauer is a true believer, while Reed is a shameless opportunist—but to Romney, they’re interchangeable evangelicals with the same carbon dating. 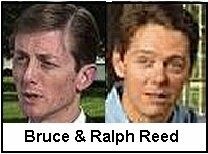 I’ve come to terms with being mistaken for Ralph Reed. But I draw the line when the same person who gets confused with me starts being confused with Gary Bauer. I could live with Jack Bauer, or even Eddie. Both appearances were rich in political symbolism and irony. New York and Texas have long been on opposite sides of the blue-red divide, disagreeing on 11 of the first 14 presidential elections after Texas became a state, as well as all five since 1988. New York magazine called its hometown the “Abortion Capital of America.” Houston is the energy capital of America, if not the world. Bloomberg’s choice of venue made more sense than his predecessor’s. Nearly half a century after JFK went to Houston to promise Protestants he wouldn’t take orders from the Vatican, Giuliani asked the Baptists’ forgiveness for not doing the pope’s bidding. If crossing paths in Houston was a coincidence, it was a revealing one. Giuliani’s never-ending stumbles over such an obvious hurdle as abortion suggest that he has approached his campaign with insufficient seriousness. By contrast, Bloomberg’s calculated bids for attention on climate change, education, and guns give every indication that his unannounced campaign for the presidency is running on all cylinders. In the end, the two parties aren’t likely to give Bloomberg a big enough opening to win. Part of the reason that Giuliani, McCain, Romney, and Fred Thompson are struggling to claim the conservative mantle is that they’re closet pragmatists by their party’s standards. Apart from Mike Gravel and Dennis Kucinich, the Democratic field doesn’t even have an ideologue. The energy speech Bloomberg gave in Houston is one that many Democratic candidates have already given. The greatest power of a third party is its gravitational effect on the other two. To have that kind of impact, Bloomberg doesn’t even have to run. The most successful third-party candidacies—Teddy Roosevelt in 1912, Ross Perot in 1992—did less to determine the winner than to shape the debate. Woodrow Wilson and Bill Clinton would have won those elections anyway. But Roosevelt made Wilson earn a progressive mandate, and Perot inspired Clinton to put more emphasis on deficit reduction and reform. Don’t know much about history/ Don’t know much biology/ Don’t know much about a science book/ Don’t know much about the French I took. To be fair, the Republican race is a particularly difficult kind of history test. In order to pass, a GOP candidate must persuade Americans to miss the ‘80s, fear the ‘90s, and start the current decade over without Bush. For some, like Romney and Giuliani, traveling back to the Reagan era has the additional benefit of rewinding past all the positions they’ve taken in years since. The educational standards movement appears to be paying off. Between 1994 and 2006, the number of fourth-graders performing at or above basic level in U.S. history jumped from 64 percent to 70 percent. Civics scores went up, too. Jay Mathews of the Washington Post points out that scores even rose among high-school seniors, who hadn’t improved in any subject in the past eight years. Education Secretary Margaret Spellings was quick to attribute the progress to No Child Left Behind, glossing over the inconvenient fact that fourth-grade history scores rose slightly faster between 1994 and 2001 than in the years since NCLB was passed. In any case, if young Americans are making progress on these two subjects, Spellings’ boss deserves the credit. At last, President Bush may have found the perfect excuse for his failures at home and abroad. The Imperial Presidency isn’t a way to abuse power—it’s a way to teach civics. Never mind Iraq’s failures as a war—it has been a great history lesson. If anything, the Bush administration might well be accused of teaching to the test. The NAEP report says that to perform at basic level in history, fourth-graders must be able to “interpret a presidential quotation.” Give Bush credit—he has been quizzing those kids every day. While Mickey Kaus may be despondent about where the Senate is headed on immigration, he should take heart that the next generation aces the issue. On the civics test, 75 percent of all fourth-graders correctly answered that noncitizens can’t vote. If Monica Goodling were still around, those 9-year-olds would be made U.S. attorneys. Teresia is a small country that has been invaded by its neighbor Corollia. The king of Teresia is a long-standing United States ally who has been living in exile since the Corollian invasion. Teresia is an important exporter of uranium; it sends most of its supply to members of the European Union. The king appeals to the United States and the United Nations for military help in driving Corollia from his country.Identify two pieces of information NOT given above that you would need before you could decide whether or not the United States military should help Teresia. Explain why each piece of information would be important. C’mon, kids! How many countries does the president have to invade before you start getting the right answer? Only 13 precent of eighth-graders had an “acceptable” response, which is even lower than the president’s own ratings. Just 3 percent of the responses were “complete”—so Bush is not the only one. Bush can take some comfort as well from the sample answer in the NAEP report. That particular eighth-grader outperformed Bush by asking to know more about Corollia’s motives and allies. But the student didn’t ask anything about whether Teresia was really exporting uranium. Of course, President Bush may be a great teacher, but how would he do on the test? The past six years have trained him well for one measure of basic fourth-grade achievement: “Students should know that the world is divided into many countries.” Bush has spent enough time around the Coalition of the Unwilling to know that. But other NAEP standards might be harder to meet. In civics, fourth-graders at the basic level should be able to “recognize that the president is an elected official” (somewhat more difficult since 2000) and “identify an illegitimate use of power” (which may have been Lynne Cheney’s real objection to these standards all along). Hear Me Roar: These are tough times for the newspaper business, so editors everywhere should be grateful to Slate’s parent company, the Washington Post, for an ingenious cost-saving measure—the reusable headline. Saturday’s Post carried a story entitled, “Giuliani Tries To Clarify Abortion Stance.” No matter how many times Giuliani addresses the subject, it’s the only headline any newspaper will ever need. This weekend, Giuliani was busy clarifying his abortion stance on Fox News Sunday. “Let’s start with abortion and any confusion that remains about where you stand,” Chris Wallace began. The more Giuliani tried to extricate himself, the more he had left to clear up. Wallace asked, “Most Americans would feel passionately one way or the other. Why are you so indifferent to such a deeply held issue?” Giuliani insisted, “I’m very, very passionate about the issue.” He proved how much he cares about abortion by repeatedly referring to the landmark case as “Roe against Wade.” Moments later, when Wallace asked him if he’d be upset if Roe were overturned, Giuliani showed all the passion of Mike Dukakis. “I don’t think it’s a question of being disappointed or being happy about it,” he said. Vive l’indifference! On Friday, Giuliani tried to recast his views on abortion and guns as a profile in courage. On Sunday, he once again made clear that he was brave enough to pander. He promised not to change the pro-life Republican platform. He affirmed his support for abortion limits he used to oppose. He promised conservatives what they want most on abortion—strict constructionist judges. And as an example of what he means by judges not legislating from the bench, he praised the D.C. Circuit’s recent decision to overturn a 1939 Supreme Court precedent on the Second Amendment. It’s hardly news when a thrice-married man clarifies his stance that he is not a woman. But Giuliani went further, volunteering that he will never be a woman. Fox viewers can rest assured: Some options are off the table. The strict constructionist reading of “If you said to me, as a woman” is clear: Giuliani thinks he’s a woman. Another flip-flop! But a more liberal interpretation might reach the opposite conclusion: Giuliani thinks Chris Wallace is a woman. No wonder Giuliani is losing the Republican base. He has done so many Inner Circle productions, he thinks “fair and balanced” is Rosalind in As You Like It—a man playing a woman playing a man playing a woman. Either way, Giuliani’s second point is as confusing as the first. Giuliani says he would happily defer not just to Chris Wallace but to any other woman who has “an equally strong view of this” as he does. Yet as Wallace demonstrated at the outset of the interview, it would be hard to find anyone in either gender as indifferent to the subject as Giuliani. Giuliani is not alone. Mitt Romney doesn’t want a religious test or a history test. His about-face on abortion is even less convincing than Giuliani’s. Sam Brownback, Mike Huckabee, and Tom Tancredo, who don’t believe in evolution, want to prove there’s no science test. All the Republican candidates are supply-siders, hoping to prove there’s still no math test. As a last resort, Giuliani now wants to turn his abortion stand into a badge of honor. The press will give him credit for setting up a showdown with social conservatives. Today’s Times gave the Giuliani campaign the headline they want: “Can the G.O.P. Accept Giuliani’s Abortion Stance?” But Giuliani’s abortion stance is such a muddle, the issue is not whether a pro-choice candidate can win in a pro-life party. It’s whether a campaign predicated on leadership can survive a candidate who has already said he was for Roe before he was against it. Emily Bazelon made a good case for why voters have a right to judge Giuliani’s presidential bid by his disastrous home life. Here’s another reason: His presidential bid is rapidly starting to mirror his disastrous home life. Giuliani seems to have the same attitude toward his abortion positions that he has shown toward marriage—who’s counting? The Times offers a helpful interactive timeline of “Giuliani on Abortion.” In 1989, he was for public funding. In 1993, he called choice a constitutional right. In 2000, he opposed a ban on late-term abortions. Last month, he divorced himself from his previous stands on public funding and late-term. This month, he sought to annul his position on choice as a constitutional right. Now he’s of three minds: Abortion is “morally wrong,” women should be able to make their own choice, and so should conservative judges. Giuliani’s decision to buck his party on abortion would be refreshing and courageous, if he hadn’t already tried so hard to have it both ways on the issue. He tells conservative audiences not to worry about his pro-choice record because he personally “hates” abortion and will appoint judges like Scalia, Roberts, and Alito. He boasts that during his tenure as mayor, abortions dropped 16 percent—but doesn’t mention that abortions nationwide dropped 15 percent over the same period or that New York City still has an abortion rate three times the national average. Welfare reform has done a great deal to promote work, demand responsibility, and reduce poverty, but even ardent proponents like me have trouble crediting it with short-term reductions in abortion. Most conservative welfare reformers had the opposite worry—that a concerted effort to reduce illegitimacy might cause a spike in abortions. During the 1996 welfare reform debate, Senate Republicans rejected House plans to deny benefits to unwed teen mothers and cap benefits for mothers who had additional children on welfare for that very reason—Catholic conservatives feared those provisions would make abortion go up. A plan to reward states for reducing out-of-wedlock births was rewritten to deny the bonus to states where abortion rates increased at the same time. Of course, Giuliani urged Clinton to veto the 1996 welfare reform bill, so don’t be surprised if he now claims his moral opposition to abortion as the reason. Why does the choice issue so often manage to turn grown men into pretzels? Conservative doubts over Giuliani’s abortion position were hardly a surprise attack. Yet judging from his halting response so far, the same man who knew just what to do on 9/11 would have been stumped for months if al-Qaida had simply sent him a NARAL questionnaire. Mood Ring: If malaise, like revenge, is a dish best served cold, the Bush administration is keeping Republicans exceedingly well-fed. In the latest Newsweek poll, the president matched Jimmy Carter’s record low with a 28 percent approval rating. It took Richard Nixon a quarter-century to have Seven Crises. For George W. Bush, seven crises is a pretty good week. Republican presidential candidates are trying their hardest to look on the bright side. At last week’s debate at the Reagan Library, the field mentioned optimism more often than bin Laden. Giuliani chanted the word four times—three times in a single answer. Bush’s favorite word, resolve, didn’t come up once. Republicans may be right to miss Reagan—not because his policies worked, but because the country has so soured on their party that only an actor could still put on a happy face. That’s the role many Republicans have scripted for Fred Thompson. They don’t much care what he stands for, provided he can cheer Republicans up. Thompson echoed another actor-turned-politician by repeatedly borrowing Arnold Schwarzenegger’s trademark tic, “and things of that nature.” He closed his speech by inadvertently giving a good impression of Reagan’s famous “Highway 1” closing statement in the second 1984 debate. In Thompson’s rambling story, a group of sixth-graders in North Hollywood asked him why he went into politics. The question made him think back to Washington, Lincoln, the Revolutionary War, and our common heritage. The answer: not clear. But the award for most surprising performance by an anecdote in a supporting role goes to two other historical cameos in Thompson’s speech. In a rare turn for the 2008 Republican campaign trail, Thompson praised Wendell Willkie, the Republican nominee who lost the 1940 election in a landslide but became one of FDR’s most important allies. Perhaps that was Thompson’s indirect way of saying something nice about Bush. The next line in Churchill’s eulogy fits Bush even better: “It fell to [him] in one of the supreme crises of the world to be contradicted by events, to be disappointed in his hopes, and to be deceived and cheated by a wicked man.” More likely, Thompson was just making the noble point that compared with politicians today, Churchill was a class act. In any case, it’s a modern political first: Fred Thompson could go down in history as the only presidential candidate in either party to put in a good word for Neville Chamberlain. Could this be the future of conservatism? Will Republican candidates try to prove they’re not the next George W. Bush by leaving open the possibility of being the next Neville Chamberlain?